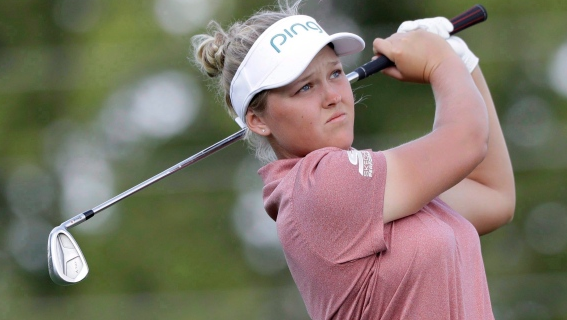 Brooke Mackenzie Henderson is simply known as Brooke Henderson is a famous Canadian professional golfer on the LPGA Tour. In the year 2014, she turned into professional. Her current tour is LPGA Tour. She was named the Canadian Press female athlete of the year for 2015 and 2017. She has altogether won 12 times in her profession. At the age of 18, she won her first major at the KPMG Women's in the year 2016. 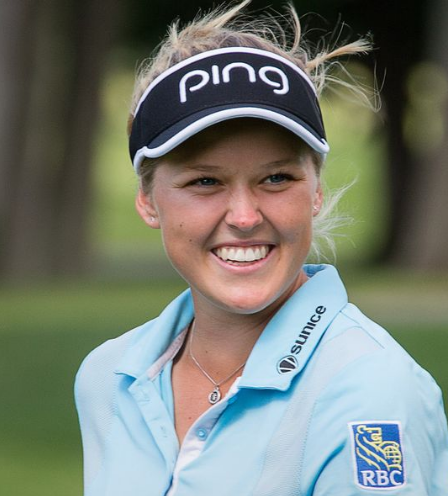 She won the Canadian Women's Amateur in 2013 and finished runner-up at the 2014 U.S. Women's Amateur. For being first Canadian to Win the Canadian Women's Open in 45 years. On 10th September 1997, Brooke was born in Smiths Falls, Ontario, Canada. Her nationality is Canadian. Her full name is Brooke Mackenzie Henderson. Her father name is Dave Henderson and mother name is Darlene Henderson. Her Birth sign is Virgo. Her ethnicity is White. She also has a sister named Brittany Henderson who is also a professional golfer. Currently, his residence is Smiths Falls, Ontario, Canada. Brooke has a tall height of 1.63 m and has the weight of 50 kg. She has balanced health. In the year 2015, April, Brooke set a tournament record with her 36-hole score at the LPGA Tour's Swinging Skirts LPGA Classic. She was also the first Canadian to win on the LPGA Tour since Lorie Kane in 2001. Later, she was granted immediate LPGA Tour membership. In the year 2016, June, She won her first major championship, at the KPMG Women's PGA Championship at Sahalee Country Club near Seattle. She became the youngest to win that major, the second-youngest in any women's major, and the first Canadian to win a major in 48 years. She was also a member of the Canadian Olympic Team for the 2016 Summer Olympics in Rio de Janeiro in the women's Olympic golf tournament, positioning seventh. She won at the McKayson New Zealand Women's Open was her first LPGA championship outside North America in 2nd October 2017. On 14th April 2018, she won the Lotte Championship; her sixth victory on the LPGA Tour; finishing at 12 to win by four strokes over Azahara Munoz. She successfully became the first Canadian in 45 years - after Jocelyne Bourassa in 1973 - to win the Canadian Women's Open at the Wascana Country Club in Regina, Saskatchewan on 26th August 2018. The net worth of Golfer, Brooke is estimated to have $4 Million. The salary of Brooke is $600,000. Brooke is a very secretive person. She has never mentioned about her relationship to the media and her love life is still hidden. Once, she was rumored to be dating a golfer guy. She won the Canadian Women's Amateur in 2013, and finished runner-up at the 2014 U.S. Women's Amateur. She successfully became the first Canadian in 45 years - after Jocelyne Bourassa in 1973 - to win the Canadian Women's Open at the Wascana Country ClubShe successfully became the first Canadian in 45 years - after Jocelyne Bourassa in 1973 - to win the Canadian Women's Open at the Wascana Country Club. She won at the McKayson New Zealand Women's Open was her first LPGA championship. She was also a member of the Canadian Olympic Team for the 2016 Summer Olympics in Rio de Janeiro. She won her first major championship, at the KPMG Women's PGA Championship at Sahalee Country Club.